Later, as I was drinking it, all I could think about was how I could integrate this savory and spicy chocolate into food. This sauce was the first thing that came to mind because I love the combination of pumpkin and chocolate. The only problem was that I had to wait for more to arrive before I could start tinkering about in the kitchen. You see, I had to order more since it had all disappeared. In order to prevent the problem from reoccuring, I ordered two bags; the chocolate is just that good. Place the guajillo chilis in a hot dry pan. Toast each side, careful not to burn. Transfer to a bowl and add 1 cup hot water to rehydrate. To the same hot dry pan, add the onion halves and tomatoes. Blacken the sides. Transfer to a blender. Add the guajillos and soaking liquid, garlic and pumpkin puree. Process until the sauce is smooth. Transfer to a pot and bring to a simmer on the stove. Add the cumin, oregano and bouillon. Continue to simmer for a few minutes and then add the chocolate. Reduce heat. Whisk the chocolate into the sauce. Cover and let sit as you cook the pasta. Just prior to serving, add the walnut oil and season with salt and pepper. 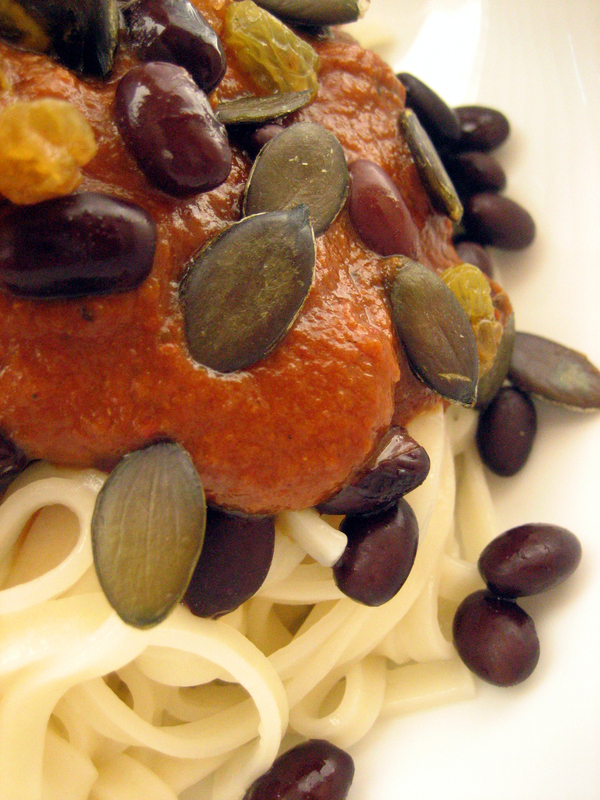 Serve over pasta [I used chewy Udon noodles] and garnish with black beans, pumpkin seeds and golden raisins. Wow, this looks amazing! I am going to torture, no, wait, treat my kids to this soon. LOL, Susan. Have fun with your savory torment! I am going to be in Santa Fe this weekend. I am going to keep my eyes peeled for this place! 🙂 Nice dish. I make mole for special occasions. I envy you that! Santa Fe is a wonderful place and if you don’t already have accomodations, check out Casa Del Toro, it’s a fantastic vegan B&B. I love authentic mole but it takes a long time to make it right. This sauce is a quick weeknight version that will dance around the edges of your memory and remind you of why you love the real deal so much. This looks incredible. I can’t think of a time when I have had a pumpkin/ chocolate combo… and it seems ridiculous that I haven’t! It’s a great combination whether savory or sweet! OMG how did I miss this!! I am flattered beyond words, and also THRILLED that you ordered more… they have SUCH awesome stuff!! I can vouch for both Kakawa AND Casa Del Toro as two of the best places in Santa Fe!! If you hear a weak scratching on your door tonight? Well, it’s cause I CRAWLED THERE on my hands and knees DROOLING! !